Incubator for creative Industries in Rethymno , Θερμοκοιτίδα Επιχειρήσεων , Βιο.Πα Ρεθύμνου Ρέθυμνο | Culture secretary looks to London Olympics in 2012 to provide a "'galvanising force' for the creative industries". Culture secretary looks to London Olympics in 2012 to provide a "'galvanising force' for the creative industries". The culture secretary, Andy Burnham, has attempted to bolster the media industry in the face of a deepening economic downturn by urging it to look towards the "antidote" of the London 2012 Olympics. Burnham said that the UK must weather the downturn by focusing on long-term growth and that the 2012 Olympics would provide an "antidote" and a "galvanising force" for the creative industries. "It is obviously difficult times," he said, when asked about the plunging global stock markets. "Everyone is working in this climate, and the ad industry and broadcasters face particular challenges. The trick is to take a longer-term view and not make the mistakes of the past by just looking cyclically [but] looking more broadly." Burnham was speaking yesterday at an open day involving 200 schoolchildren organised by the government's Creative Economy programme, which champions the media and arts industries. The event was held in Golden Square, home to creative industry firms including M&C Saatchi, Absolute Radio and Sony Pictures. The culture secretary said that the creative economy had grown at twice the rate of the rest of the economy for a number of years and that the goal was to maintain that level of growth. He urged the creative industries not to "give up on the future" even though times were difficult. 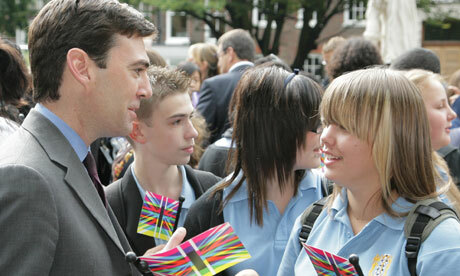 Burnham defended government plans to get more children into the creative sector despite the difficult times. He said that the challenge was for the industry to stop being too reliant on filling job vacancies through friends or family contacts. "In the past there has been a little bit too much 'did you know someone who worked here?' It wasn't what you knew but who you knew," he added. "The issue in schools is how we broaden the minds of young people and give a sense of the wider range of options out there." Burnham said that in the past in many cases if a student wanted to get into advertising they may have been "gently persuaded out of it". "It [the creative industry] is crucially important to the economic success of the country," he added. "The big thing is the creative industries need to move from the margins into the mainstream."